The face to the left says it all. Dean Ambrose had the still frame of the night to close out Monday's edition of Raw as he saw his fellow Shield member and brother of the last year and a half, Seth Rollins, sell his soul to join Evolution. Ambrose, shortly after the perfect facial expression in the moment (like most of his are), was then hit with chair shot, after chair shot, after chair shot. Endless amounts of violent thuds rang aloud in Indianapolis. With Rollins, splitting from the Shield, so many questions arise and they mostly deal with the two remaining members, Ambrose and Roman Reigns. The first question that obviously needs to be asked is, "Is this truly the end of The Shield?" Think about it; what more can they do at this point? All of them were champions for a long period of time (Reigns and Rollins, Tag Champions and Ambrose, longest reigning US Champion in WWE history.) They defeated every team that came their way with combinations of superstars like Ryback, Randy Orton, Kane, Sheamus, Big Show, Daniel Bryan, The Undertaker, CM Punk, John Cena, The Usos, The Wyatt Family, and most recently Evolution (Triple H, Randy Orton, and Batista). There was nothing more this trio could accomplish other than pulling a Hart Foundation and hold all of the gold. Some have hypothesized that this is the long con, inside job. The Shield members in tact were martyrs for the ultimate cause; ending Evolution completely. Seth Rollins is the rat. While I hope this is the scenario, I simply don't see it. Jim Ross said it best months ago, once The Shield is at their highest point as faces, the heel turn will have a greater impact. Boy, was he right. "What happens with Seth Rollins?" Instantly, his stock has risen tremendously. No one expected the heel turn from the fast-paced, energetic hybrid of Jeff Hardy and CM Punk. As soon as Rollins sold out on Monday, the fans had to be thinking, "Oh boy, wait until Roman gets a hold of you," and that's what every wrestler kills for; a reaction. Fans were setting pictures and his action figure on fire because of their disdain towards the Iowa native. You can say the turn worked. Look for Rollins to make a splash almost instantly in the Intercontinental and US Championship division in the next few months. "Reigns and Ambrose, what happens?" Many on social media are begging for The Shield to find a new third member and while the names like Sami Zayn and Solomon Crowe (alright, so I threw that one out there) have been tossed around, I feel that if the WWE was to attempt to recreate or revive The Shield, it is a horrible mistake. The Shield was comprised of three superbly talented men that have the chance to be the three biggest stars in the industry on their own in the very, very near future. Reigns is inevitably going to be the WWE World Heavyweight Champion much sooner than later. He has size, speed, agility, strength, look, charisma; he's the total package, through and through. The Superman Punch and Spear are the perfect combo for the Samoan Superman (yes, it's a stolen concept from Cesaro's "Swiss Superman") and his "OOOOAAAAHHHHH!!!!" yell is over with the crowd. The soft spoken muscle of The Shield will have no problem with success. Now, as everyone knows who reads this blog, I'm as big a Dean Ambrose fan as there is. His in-ring work has become so much tighter and diverse then their early heel run. His rebound lariat is vicious and his pure insanity in the ring is, at the very least, incredibly entertaining. It reminds me of Stone Cold Steve Austin's out of control brawls. Lastly, his mic work and mannerisms....there is NO ONE that can touch him. No one. Even you, Bray Wyatt. Unfortunately, I feel and I dread that Ambrose will be stuck in the mid-card for quite a bit. He does not deserve such fate and it's evident. He is the perfect heel, but being a babyface at the moment will hamper his progression up the ranks unless there is a drastic change in his character before SummerSlam. I truly believe, in my heart of hearts, that Ambrose, who's only twenty-eight, will be the best heel of our generation. Just let the man talk and you'll instantly hate him with his smug demeanor and cockiness, albeit warranted. "What is The Shield's legacy?" 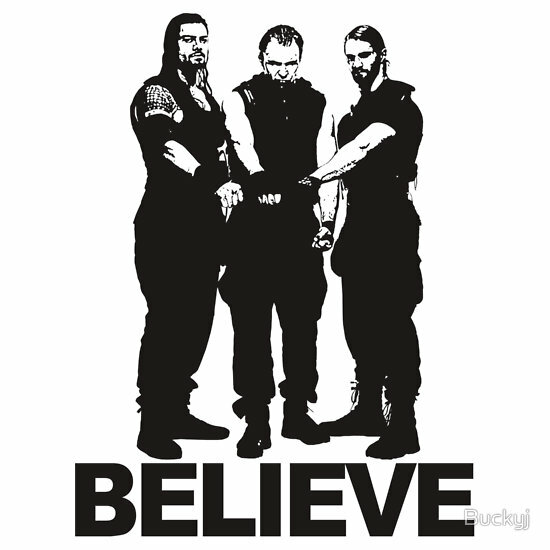 The Shield, simply put, are the greatest faction of this era and of the past ten years. They came in as main eventers and even when they were not the last match on the card, their matches were the best and most memorable. The backstage, scattered footage, NWO-like promos in their first several months were perfectly produced and performed. All three men did what the WWE wanted them to do; immediately make an impact, develop into household names and simply dominate. That is something that Nexus could not do. Something Legacy could not do. Something The Corre, 3MB, The Wyatt Family, and every other faction in the past ten years could not do. In the long run, Aaron Rift from NODQ.com said it best; if Reigns, Rollins, and Ambrose all become mega stars in the next ten years, The Shield could arguably be the greatest faction of all-time. If they do not or do not live up to their hype/expectations, then The Shield may be relegated to a Top 10 position. Personally, I believe they are the third greatest faction behind The Four Horsemen and Degeneration-X. The NWO, had it not had so many members and reincarnations, may fill that third spot, but for me, Ambrose, Rollins, and Reigns were something that was needed immediately and deliver results quickly. One cannot argue that they helped change the landscape of WWE for the best and that they served an ample amount of justice. I had not been so hyped up for a Raw, Smackdown, Main Event or any pay-per-view in a long, long time until The Shield arrived. Watching what each of them had done on the indy circuit and in FCW, I was begging for their call up for a long time. When they first smashed Ryback through the announce table at the 2012 Survivor Series, I knew they were game changers and destined for unlimited success. They are my favorite faction of all-time and yes, I mark out every time I hear their entrance music. I will always "Believe In The Shield" and support each individual throughout the remainder of their long, success filled, and legendary careers in the squared circle.